Teleportel Europe N.V. | Secure live video communication for telemedicine, telepsychiatry, telepharmacy and medical insurance services. Secure live video communication for telemedicine, telepsychiatry, telepharmacy and medical insurance services. Partenamut – a leading Belgian health fund and part of a strong national medical insurance group, has deployed intelligent, fully automatic video-kiosks to serve their customers faster, to minimize the workload for the co-workers and to save costs. The 3D4K display unit opens doors to new medical applications. The stunning 3D images in 4K -without the need to wear goggles- are out of this world. The video quality is not only a lot better than holographic images but the technology is also less expensive and a lot more flexible to customize medical processes and training programs. The system meets many needs in the medical field. A medical specialist can be transmitted to another medical facility to consult about medical conditions. Remote medical facilities can have access to a world of medical support. Even routine renewals of prescriptions could be cost-effectively renewed through remote sessions conducted at pharmacies by life-size 'telepresent' doctors with monitoring devices to transmit pertinent information, such as blood pressure, blood sugar level, temperature, etc. Also, with Virtual Teleportation™, can engage in personal and confidential consulting sessions. Applications in tele-psychiatry are proven to be very effective and can help deal with the problem of the shortage of specialized psychiatric specialists. The discussions with the psychiatric patients can be recorded and used for further analysis and treatment. Thanks to the real sense of presence and the genuine eye-contact, the patient does not find this technology threatening or unnatural. The MediCart is a mobile unit ('kiosk) mounted on casters. It enables doctors to 'make their round' in the hospital, from their workplace. Tele-pharmacy is very effective application as well. The remote pharmacist appears life-sized and in 3D, with aligned eye-contact, in front of a patient who is in an unattended pharmacy. The pharmacist scans the prescription document of the patient and stores the original in a secured container. The robot installed at the unattended pharmacy instantly fetches the correct medicine and drops it off in front of the patient. The pharmacist double checks the box (using a bar code scanner and visual control) and explains the use, frequency and dose, etc... The pharmacist can also print this information for the patient. The patient pays by credit card. If the medication is not available in the store, it can be sent to the patients' home or the patient comes at a later time to collect it. The virtual teleportation systems in combination with the pharmacy-robots, can be used for over-the-counter products but also for prescription medication. The pharmacist can now be available in multiple locations and the patients can also purchase their medication outside the normal opening hours of the pharmacy. The patient -or customer- enters a pharmacy-facility that is attended over distance. A pre-recorded video clip explains the patient what to do. The patient pushes a button on the touchscreen. A secure video/audio connection is established automatically. 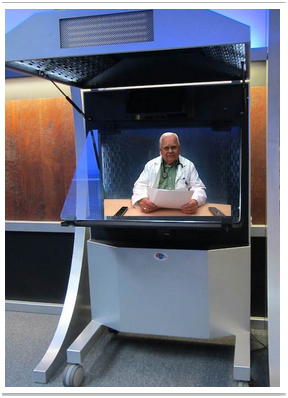 The pharmacist -in a remote location- appears in front of the patient; life-sized, in 3D and with aligned eye-contact. The pharmacist seems physically present and communicates in high quality video with the patient. The patients’ medication prescription document is scanned and transmitted. The pharmacist shows, explains and demonstrates how the medication is to be used. An integrated payment device allows the patient to submit payment using a credit card or debit card. The pharmacist in the remote location enters the code of the specific medication indicated on the prescription note. 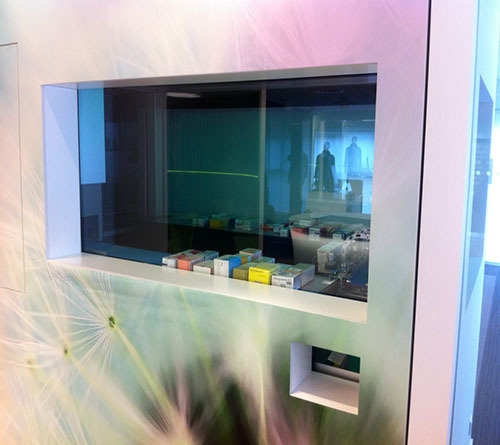 A fully equipped medication storage facility is integrated behind the video display unit. A medical 3-axis robot - controlled over distance – picks the medication box from the rack and deposits it in front of the patient. The 3 axis robot has the ability to replenish the inventory completely automatically. The MediCart is a mobile unit ('kiosk) mounted on medical casters (shock absorbing to protect sensitive equipment– reduction of noise). 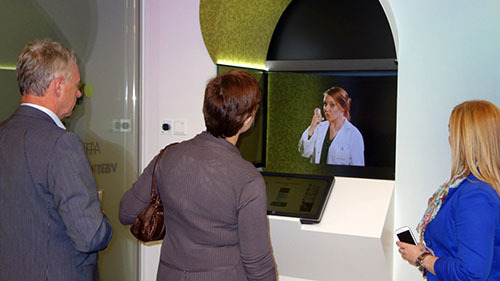 An integrated Video Communication Computer comes with HD camera, microphone and speakers, invisibly integrated into the Kiosk structure. The doctor can engage in data-sharing (i.e. showing content over distance) with the patient. High Definition displays allow the doctor to appear life-sized (real size) and with natural eye contact—a personal video experience which establishes rapport and conveys trust. The aim of the MediCart is to create a ‘sense of presence’ for the patient. With a 40 to 55” HD display and direct, aligned eye-contact with the patients, the MediCart delivers a truly personal experience of ‘presence’. Thanks to an integrated power backup system, the MediCart can be moved around easily without powering down. An antimicrobial surface is used, to combat infections by preventing the growth of bacteria, mildew, and fungi. Gesture control can be used to operate the system. This eliminates the need to physically touch a screen and reduces the risks of infections. The video codec allows the system to run over 4G when an ethernet connection is unavailable. In the rear of the unit, The MediCart can have a nurses' workstation that will secure a laptop computer; which is connected to your existing,secured network and ICT infrastructure. 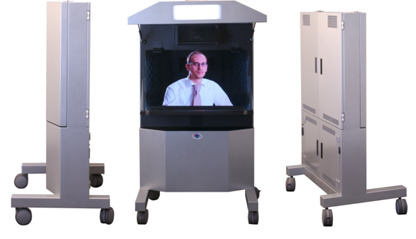 The MediCart can also feature a second 22 to 27-inch monitor/video system, used for educational purposes or for an additional video-call with a third party, such as a medical expert in another location. Or this can be a live language interpretation call (audio) with a qualified, medical interpreter residing in a remote location. Optionally, interfaces could be added to connect medical equipment and peripheral equipment such as an additional examination camera, stethoscopes, etc…. Examination cameras can be a highly effective aid, supportingimaging of wounds, dermatological assessments, neurological exams, etcT. he nurse operates/handles these devices – applies them to the patient - and the doctor – in another location – can view. If required, live video call sessions can be streamed/recorded for training purposes, for quality assurance or to store in the patients medical files, for future reference. 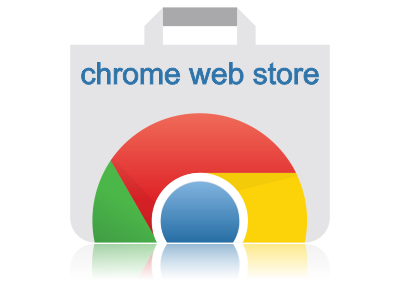 Using API’s and webservices, the application can be integrated with existing Systems, in a secure manner. The i2i-CAM is the physicians interface (Workstation) for live communication with the MediCart. Thanks to a patented reflection device it generates genuine, aligned eye-contact and engaging conversation. It can have integrated lighting.